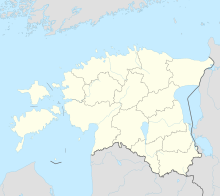 Raadi Airfield (Tartu Air Base) (ICAO: EETR) is a former air base in Estonia located 4 km (2.5 mi) northeast of Tartu. The land once belonged to Raadi Manor and is now designated as the new site of the Estonian National Museum. In 1940 100 hectares (250 acres) were requisitioned from the Raadi Manor estates to create a Russian airport. The airfield was fought over during the Second World War and the manor house was burnt during the Tartu Offensive. The airport became a major Soviet bomber base for fifty years. The secrecy of the airfield meant that foreigners were not allowed to visit the city. Few dozens of bombers were based here making it the largest Baltic airfield. This meant that the museum's collection had to be stored in places like the city's churches. The airfield is still seen as a reminder that Estonia was occupied by Soviet forces. It was a fairly extensive base with 24 large revetments and over 30 small ones. This airfield was rated in 1956 by USA to 13. position in USSR airfield priority list which means it was the only nuclear target in Baltics at this time. It was a Soviet base, home to 132 TBAP (132nd Heavy Bomber Aviation Regiment) which flew Tupolev Tu-16 and Tupolev Tu-22M aircraft. It was also a transport base with the 192 and/or 196 VTAP (Military Transport Aviation Regiment) flying Ilyushin Il-76M cargo jets until 1990. These jets were relocated to Tver. On 15 January 1991, a Soviet Air Force Tupolev Tu-16K Badger crashed near Tartu Air Base, on landing when the undercarriage failed to extend. The pilot and co-pilot ejected, but the four crew members were killed. In 2020, estimated 200,000 solar panels will be built on Raadi Airfield, making it the biggest Solar Farm in Estonia. ^ "37 Vozdushnaya Armiya VGK". Brinkster.com. ^ "The Estonian National Museum's New building". ^ "1 prize entitled Memory Field". This page was last edited on 2 April 2019, at 10:39 (UTC).